“(Teaching) is a little like being parents, at least spiritually. It is a great responsibility!…. Teaching is a serious commitment that only a mature and well- balanced person can undertake…. “The Christian message cannot be imposed; it must win hearts and minds by its own integrity and by the quality of the lives of those who profess it. “In the Gospel we have just heard, Jesus, the Master, teaches the crowds and the small group of his disciples by accommodating himself to their ability to understand. He does this with parables, like that of the sower (cf. Lk 8:4-15). The Lord is always flexible in his way of teaching. He does it in a way that everyone can understand. Jesus does not seek to “play the professor”. Instead, he seeks to reach people’s hearts, their understanding and their lives, so that they may bear fruit. ….My question to you, as educators, is this: Do you watch over your students, helping them to develop a critical sense, an open mind capable of caring for today’s world? A spirit capable of seeking new answers to the varied challenges that society sets before humanity today? Are you able to encourage them not to disregard the world around them, what is happening all over? Can you encourage them to do that? To make that possible, you need to take them outside the university lecture hall; their minds need to leave the classroom, their hearts must go out of the classroom. …. Be careful! It is not enough to analyze and describe reality: there is a need to shape environments of creative thinking, discussions which develop alternatives to current problems, especially today. We need to move to the concrete. The importance of “The way of humility” to communicate the Gospel. The need of stating “the truth of our limited and imperfect humanity” in everything we say and proclaim, without any trace of Triumphalism. The simplicity of the Message we try to communicate, without complications or excessive rationalisations that make it opaque and not understandable. Generosity in acknowledging the work of God in the life and history of people, accompanied by sincere admiration, joy and hope whenever we find in others goodness and dedication. “Like the older brother of the prodigal son, we can be doing everything right and still, somehow, be wrong…. If, instead of our speaking the truth, there are elements of elitism, arrogance, anger, lack of respect, lack of understanding, or worse still, embittered moralising, our truth will not be heard, not because our truth is wrong but because our energy is. That is why Jesus warns us to “speak our truth in parables.” Truth is not a sledgehammer; it is an invitation that we must respectfully offer others. …. We may well have the water of life, the truth that sets people free, and the right cause, but nobody except our own kind will accept to receive it from us if our energy is wrong or our understanding of that truth is wrong…. More often than not, we are not being listened to because we are misguided, elitist, non-empathetic, or flat-out unloving, not because we are warriors for truth or justice. “You can’t evangelize without dialogue. It’s impossible. Because you must begin from where the person who is to evangelized comes from. “Parents must be acknowledged as the first and foremost educators of their children. Their role as educators is so decisive that scarcely anything can compensate for their failure in it…. Beautiful and truly solemn is the vocation of all those who assist parents in fulfilling their task, and who represent human society as well, by undertaking the role of school teacher. This calling requires extraordinary qualities of mind and heart, extremely careful preparation, and a constant readiness to begin anew and to adapt…. Transmit to (students) the doctrine of salvation in a way suited to their age and circumstances…. The Catholic School aims to create for the school community an atmosphere enlivened by the gospel spirit of freedom and charity…. “It is when Catholic education opens the hearts of young people to the knowledge of Jesus as the one who reveals what love means, that it brings its unique contribution to the good of society, especially to society so often trapped in greed, exploitation and superficiality. And this is the point—we think that we have every reason to have confidence in Christian youth: youth will not fail the Church if within the Church there are enough older people able to understand it, to love it, to guide it and to open up to it a future by passing on to it with complete fidelity the Truth which endures. Then new workers, resolute and fervent, will in their turn enter upon spiritual and apostolic work in the fields which are white and ready for the harvest. Then the sower and the reaper will share the same joy of the kingdom. “Education is about bringing the very best from within young people; it is about challenging them to go beyond themselves and to be able to dream great things and realise great things. Religious education, education in the faith, is not just about commandments and laws, as the unfortunate Pharisee fell into the trap of thinking. The Pharisee became proud and looked down on others. Education in the faith is about authenticity which is always marked by a certain modesty in life style…. We live in a society in which authenticity and modesty in life style are being undermined by a culture of empty spin and a culture of celebrity. In the media, in advertising, in fashion, in politics — so often we are tempted into accepting a view of life and reality which is created by simply spinning words and images, rather than authentically looking at life with its mixture of challenges and successes, opportunity and failure. A culture of spin, because it is empty, will always end up as a culture of arrogance on the part of those who use it, and of frustration on the part of those who fall for it. “It is a poorly paid job, but it’s beautiful because it allows us to see the people who are entrusted to our care grow day after day. It is a little like being parents, at least spiritually. It is a great responsibility! Teaching is a serious commitment that only a mature and well- balanced person can undertake. Such a commitment can be intimidating, but remember that no teacher is ever alone: they always share their work with other colleagues and the entire educational community to which they belong. … As Jesus taught us, the Law and the Prophets are summed up in two commandments: love the Lord your God and love your neighbour (cf. Mt 22:34-40). We can ask ourselves: who is a teacher’s neighbour? Your students are your “neighbour”! It is with them that you spend your days. It is they who await guidance, direction, a response — and, even before that, good questions! … the duty of a good teacher — all the more for a Christian teacher — is to love his or her more difficult, weaker, more disadvantaged students with greater intensity…. “Young people need authentic teachers: persons open to the fullness of truth in the various branches of knowledge, persons who listen to and experience in own hearts that interdisciplinary dialogue; persons who, above all, are convinced of our human capacity to advance along the path of truth. Youth is a privileged time for seeking and encountering truth. As Plato said: “Seek truth while you are young, for if you do not, it will later escape your grasp” (Parmenides, 135d). This lofty aspiration is the most precious gift which you can give to your students, personally and by example. It is more important than mere technical know-how, or cold and purely functional data. “How many times do we act as controllers of faith, instead of becoming facilitators of the faith of the people? There is always the temptation to try and take possession of the Lord.” … So often “we control faith rather than facilitating it”, and this is something “which began in Jesus’ time with the Apostles”. We are tempted to “take over the Lord”. — Pope Francis I, preaching at his daily morning Mass at St Marta’s in the Vatican, 25th May 2013 (Two slightly different translations: the first appeared in ‘The Irish Catholic’ newspaper, 2nd June 2013 in a story entitled ‘Open your church doors and do not be faith inspectors, pontiff tells priests’ by Gerry O’Connell; the second translation is by the Italian newspaper ‘L’Osservatore Romano’ as posted on the Vatican website). “The Curé of Ars dealt with different penitents in different ways…. “The word ‘authority’ comes from the Latin ‘augere’ (to grow). All authority, whether it be civil, parental, religious, or community, is intended to help people grow towards greater freedom, justice, and truth. Often, however, it is used for the honour, power, privilege, and positive self-image of those who exercise it. 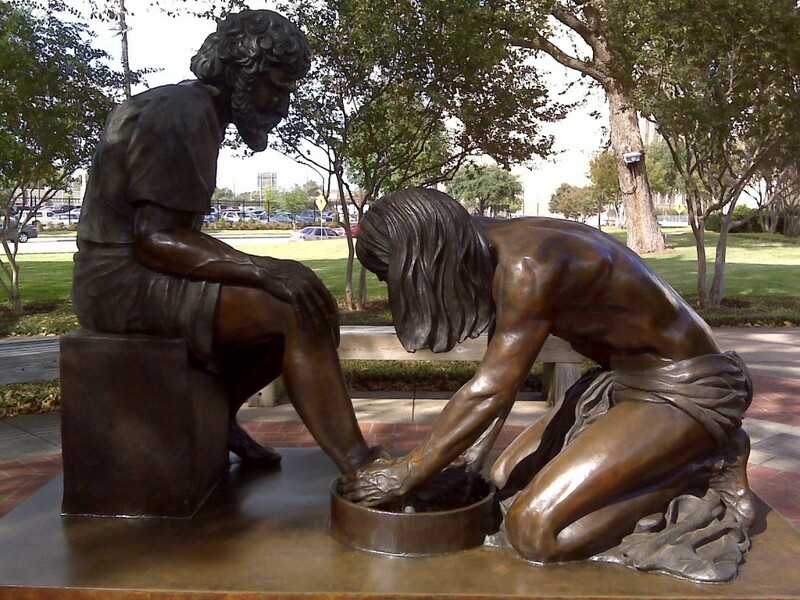 By stooping down to wash the disciples’s feet, Jesus calls us all to exercise authority humbly, as a service. “All of us experience tension in our lives: tension in our families, tension in our friendships, tension in our places of work, tension in our churches, tension in our communities, … And, being good-hearted people, we carry that tension with patience, respect, graciousness, and forbearance – for a while! Then, at a certain point we feel ourselves stretched to the limit, grow weary of doing what is right, feel something snap inside of us, … and we let go… We let go of patience, respect, graciousness, and forbearance, either by venting and giving back in kind or simply by fleeing the situation with an attitude of good riddance. Either way, we refuse to carry the tension any longer. But that exact point, when we have to choose between giving up or holding on, carrying tension or letting it go, is a crucial moral site, one that determines character… How much tension can we carry? How great is our patience and forbearance? How much can we put up with? Mature parents put up with a lot of tension in raising their children. Mature teachers put up with a lot of tension in trying to open the minds and hearts of their students. …. Men and women are noble of character precisely when they can walk with patience, respect, graciousness, and forbearance amid crushing and unfair tensions, when they never grow weary of doing what is right.